What is red peony? What is it used for? Red peony is one of three species of peony used in traditional Chinese medicine. The others are white peony (bai shao) and tree peony, or moutan (mu dan). When referring to red peony, the root of the plant is used in herbal preparations. Peony contains a unique compound called paeoniflorin, which is believed to calm the nerves and reduce the incidence of muscle spasms. In traditional Chinese medicine, red peony was used for bleeding or lack of blood movement, depending on how it was prepared. In animal tests, red peony extracts stop blood platelets from clumping, although these tests have yet to be replicated in humans. Other tests have shown that red peony can help patients with viral hepatitis. How much red peony should I take? The recommended dosage for red peony is 1-3 grams in capsule form three times per day. What forms of red peony are available? 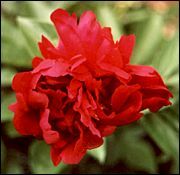 Red peony is available as a powder or extract. Powdered red peony is also sold in capsule form. What can happen if I take too much red peony? Are there any interactions I should be aware of? What precautions should I take? Red peony has been given a class one rating by the American Herbal Products Association, meaning it is safe when used in recommended doses. However, it should not be used by women who or pregnant or lactating. At this time, there are no well-known drug interactions with red peony. As always, make sure to consult with a licensed, qualified health care provider before taking red peony or any other herbal product or dietary supplement. Bensky D, Gamble A, Kaptchuk T. Chinese Herbal Medicine Materia Medica, revised edition. Seattle: Eastland Press, 1993, pp. 277-8. Foster S, Yue CX. Herbal Emissaries: Bringing Chinese Herbs to the West. Rochester, VT: Healing Arts Press, 1992, pp. 200-207. Okubo T, Nagai F, Seto T, et al. The inhibition of phenylhydroquinone-induced oxidative DNA cleavage by constituents of moutan cortex and paeoniae radix. Biol Pharm Bull 2000;23:199-203. Qi XG. Protective mechanism of salvia miltiorrhiza and paeonia lactiflora for experimental liver damage. Chung His I Chieh Ho Tsa Chih 1991;11:69, 102-4. In Chinese. Wang CB, Chang AM. Plasma thromboxane B2 changes in severe icteric hepatitis treated by traditional Chinese medicine  dispelling the pathogenic heat from blood, promoting blood circulation and administrating large doses of radix paeoniae  a report of six cases. Chung His I Chieh Ho Tsa Chih 1985;5:326-8, 332. In Chinese.